Canada is a home to the scenic landscape beauty and many world class cities and provinces. A huge number of people every year immigrate to Canada to work, study, and business or for permanent residency. However, when you plan to settle in Canada you must choose a city or place that suits best you from all aspects, i.e. job opportunities, working conditions, infrastructure, services, geographical location, cost of living, education, housing, climate, culture and so on. If you are planning to move to this incredible country, we shall update you about how you should choose a city to live in Canada. How to choose the right city? 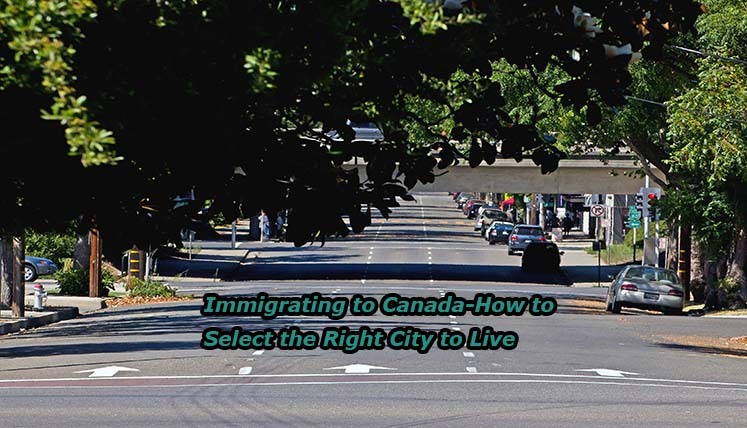 Choosing a city to live in Canada will depend on various aspects related to our daily life. Below are a few of these key aspects which often guide you to choose the best place to live. If you are skilled in a certain skilled profession, you must concentrate on finding a city wherein your skills are highly in demand. Choosing such city will keep you stress free about the number of job opportunities available for you. Choose a city or territory where quality health facilities are available in terms of public and private hospitals, clinics, diagnostic centers, General practitioners, emergency services, and so on. Gathering knowledge about the cost of living of any particular place is very important, i.e. state taxes, price of goods and services, transportation, etc. The availability of proper housing is also a crucial aspect of the stay. Make sure the various properties are available in the region easily for buy or rent. Also the housing prices should also need to be affordable. It’s good to confirm clearly about the climate in the city you are planning to move and its communities and culture. Is both these things are as per the liking of you and your family; it will take lesser time for you to get settled there. This is also an important aspect of your research for the selection of the city as people often prefer to live in relatively big or smaller city due to various reasons. The new immigrants to Canada often prefer the large cities i.e., Vancouver, Montreal, and Toronto etc. These cities often have the right atmosphere, facilities, job opportunities etc. for the newcomers. However, you may also opt for medium sized cities, i.e. Ottawa, Halifax, Hamilton, London, Newfoundland and Labrador, Calgary, Quebec, London, Edmonton, Kitchener, Saskatoon, Victoria, Regina, etc. These cities often have the similar living standard and facilities. If you prefer to live in relatively smaller cities, then the cities, such as, Moose Jaw, Moncton, Sydney, Red Deer and Kelowna, Corner Brook, Brandon, Charlottetown, etc. As these cities will have the lowest cost of living as compared to the bigger ones, with almost same infrastructure facilities and communities. You may also opt for the outer cities if you prefer to live among natural environment and wide open spaces. However, it would be better to choose a place which is closer to the big towns or cities. How to get the key assistance regarding the permanent residency and immigration procedure in Canada? Well, if you are planning to immigrate to any city of Canada, you need to go through a multifaceted immigration procedures and documentations to apply for a Canadian Visa. In case, you miss out on any key aspect or procedural guideline, it could lead to a denial of your candidature, which is the last thing you would want, as the visas needs to be approved within a limited period of time most of the time.